Whether you are an Artist or not so much of an artist, we will take you on a beautiful journey into the world of colors and beauty. Canvas and Cafe is a unique place where families, friends and colleagues can get together, paint, drink coffee/ Wine & have fun in a creative environment!! Between the cocktails and our easy step-by-step instructions bring out the artist in you - Just Like That !! Team building activities and other Corporate events, both onsite and offsite. Customizable packages are available based on your needs for drinks and snacks. "Our team had a private event with canvas and cafe. It was an absolutely fun learning experience. The venue was clean and organized, with lots of snacks and drinks prepared. Deepa was friendly and patient - she makes sure that everyone can follow the instructions and have fun at the same time. We all ended up with a painting that's way above our expectation." "I had a great experience with Canvas and Cafe. You don't need to be an expert painter to do this. It's perfect for beginners who would love to spend some time with friends and learn how to paint. Deepa will guide you from beginning to the end. You'll be surprised how beautiful you're painting will turn out! The whole session is very relaxing and interactive, while you are sipping on your favorite beverage. The best thing is once you are finished, you can sign your painting and take it home! Way to go Deepa!" 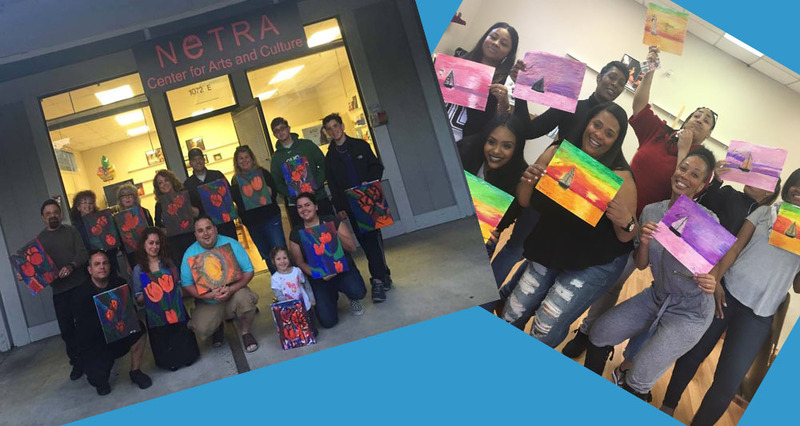 Organize fun private parties or birthday parties while you put paint on canvas where everyone takes home a memorable work of art. Everyone gets to enjoy a beverage of their choice with snacks. I had an excellent time celebrating my mom's birthday with my family here! We all enjoyed wine she provided (and we brought on our own) while Deepa walked us through the steps. It was a ton of fun and we can't to go back. It was also very nice of Deepa to bring a cake and candles for my mom, chocolate - her favorite! Come, work on your artistic skills out with family and/or friends, sipping coffee, tea or wine with snacks.